In 1922 plans were filed with the New York City Dept. of Buildings for a $50,000 2-story brick garage and stores at 520 to 528 Broome St. and 55 Thompson St. The owner was Tunnel Garage, Inc., 3 Charlton St., and the architect was Hector O. Hamilton, 17 W. 42nd St. In July 1922 the journal, The Iron Age, reported, "The Tunnel Garage, Inc., 55 Thompson Street, New York, has awarded a contract to T. J. Murphy, Inc., 2 West Fifty-fifth Street, for a new two-story automobile service and repair works at Broome and Thompson streets, estimated to cost about $55,000." Regarding the Tunnel Garage, Christopher Gray wrote as follows in the New York Times, 6 Sept. 1998, "A syndicate of local businessmen, headed by George L. Stivers, a Charlton Street physician, put up this unusual building in 1922, designed by the architect Hector O. Hamilton. 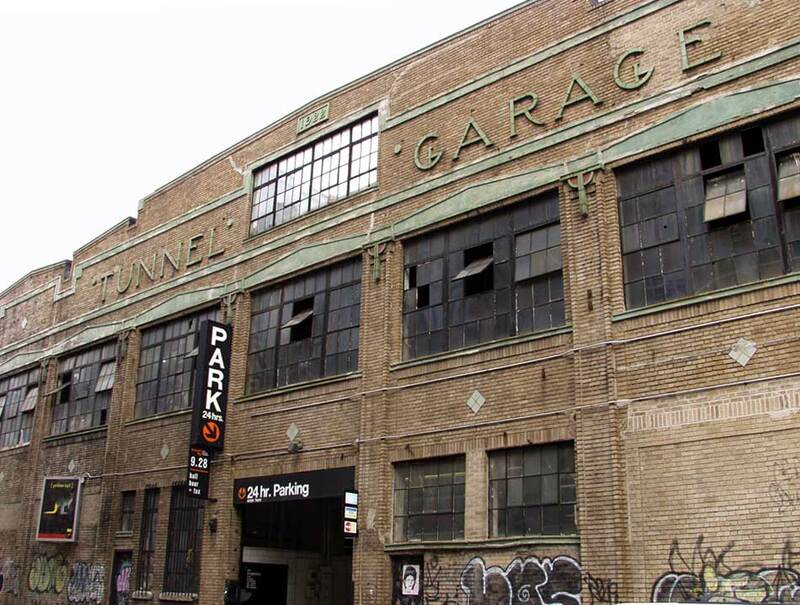 The name Tunnel Garage is used in the original incorporation papers and also in terra cotta on the building itself -- Stivers must have been referring to the Holland Tunnel, in construction nearby and completed in 1927. 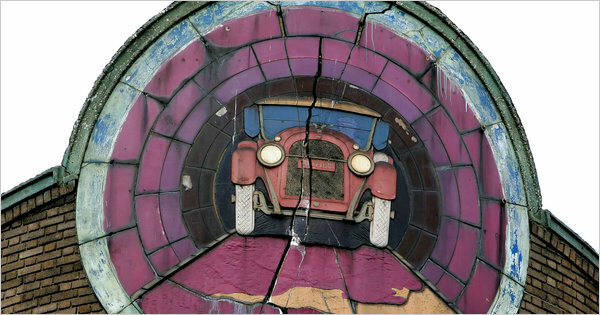 Although covered by signage in recent years, the curved corner and terra-cotta medallion of an automobile has made the Tunnel Garage well known to architecture buffs. Even before the tunnel, the garage was serving the increasing traffic flowing through the southwest Village along the new, southerly extension of Seventh Avenue, completed in 1914. Hector O. Hamilton was born in England and arrived in the United States in 1918. In 1932 his colossal modernist-Gothic design won the competition for a palace of the Soviets to be erected in Moscow. But in 1933 Hamilton was replaced by a Russian architect, and he charged that he had been dropped because of his refusal to become a Communist. According to John Young, Deputy Director of the Manhattan office of the Department of City Planning, the City Planning Commission is now reviewing a request to replace the two-story, 188-car garage with a new five-story garage accommodating 400 vehicles." The New York telephone directory listed the Tunnel Garage under the name, Holland Tunnel Garage Corp. from 1927 to 1929. In 1930 this changed to Tunnel Thompson & Broome Garage Inc., which stayed the name through 1940. I have not been able to find a telephone listing between the years 1941 to 1970. From 1970 through 1980, Tunnel Garage was listed. The Tunnel Garage was demolished in 2006. A story in the New York Times, 28 March 2006, dwells on the uncovering of a terracotta image of a car coming out of the Holland Tunnel. The image had been covered by a schlock 24-hour parking sign for the past 25 years. A beautiful 1923 image of the Tunnel Garage by the Wurts Bros. is available at the Museum of the City of New York. In 1901 George Lincoln Stivers (1878-1939), Kings County Hospital, was recorded as a member of the Kings County Medical Society. In 1904 he was elected to membership in the Associated Physicians of Long Island, when he lived at 303 Vanderbilt Avenue, Brooklyn. In 1918 he registered for the World War I draft, age 40, born 28 April 1878, a physician, in business for himself at 3 Charlton St., Greenwich Village. The 1925 Polk's New York City Directory listed George L. Stivers and Edward E. Berrigan as officers at Tunnel Garage Inc. Edward Egbert Berrigan (1873-1948) lived at 3 Charlton St. from 1905 to 1913. He worked at the New York City Finance Dept. and was mentioned in his death notice as paymaster (New York Times, 25 Jan. 1948).